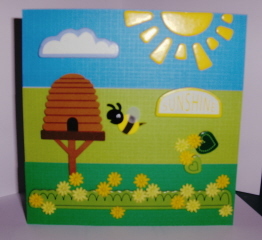 The theme of this weeks Tuesday Challenge set by the Bee Crafty team is "Ray Of Sunshine". I have used 6 x 6 white basic card stock this week, covered with three DCWV adhesive strips in blue, lime and green. Various chip board, foam and paper embellishments were added to the card along with some adhesive flowers (cut from a long strip). A very simple and quick card to make. Lovely card Debz, I love the colours makes me wish summer was here.